The purpose of this Bible Study is to provide you with some tools that will help you deepen your relationship with God. Before you knew God, you lived by a different set of rules and principles. When you become a Christian everything changed about your life. The limits that you had before are gone because you have become a daughter of God. This will allow you to have an awesome life. This means that you will grow, flourish and understand who you really are as you receive God’s love. You will deal with the challenges that come in life and not be a victim but a victor. 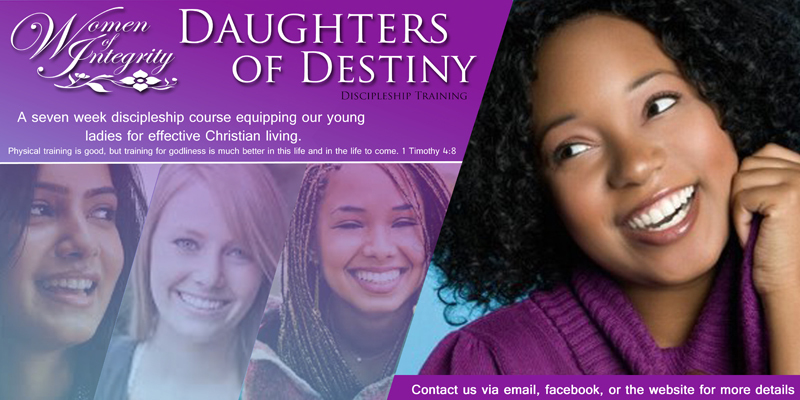 Check back for our next 7 weeks Daughters of Destiny class.